Teach a child to be polite and courteous in the home, and when he grows up, he'll never be able to merge his car onto the freeway. One nice thing about egotists ... they don't talk about other people. I used to be indecisive. Now, I'm not sure. Take a corpse and put it where you will! You will see that it does not resist being moved, nor murmur about its position nor protest when it is cast aside. If it is placed on a throne, it will not raise its eyes up, but cast them down. If it is clothed in purple, it will look twice as pale. This is a truly obedient man. He does not judge why he is moved; he does not care where he is placed; he does not insist on being transferred. If he is raised to an office, he retains his customary humility. The more he is honored, the more unworthy he considers himself. I am happy to say that I finished reading Harry Potter and the Deathly Hallows this evening. As with the previous installments, I very much enjoyed the book and was surprised to read that what I expected about the Boy Who Lived was both correct and not. More than that I will not say, so as not to spoil the read for those who have not yet reached the end. No one should flatter himself for doing anything a sinner can also do. A sinner can fast, pray, weep and mortify his flesh. This one thing he cannot do: be faithful to his Lord. Therefore we should glory in this: if we give back to the Lord the glory that is his, if we serve him faithfully and ascribe to him whatever he gives to us. Jeff from Thursday Night Gumbo sent me this picture from the Rough Riders playing at the Dr Pepper Ballpark in Texas: Thom of Ad Dominum is bound to get a kick out of this picture, but he might well kick back, too! In his e-mail, Jeff points out: "You'll notice that the world's greatest soft drink is definitely in fair territory." It is, after all, the King of Beverages, which, incidentally, sounds like a great name for a web site. Last week as I travelled the deanery collecting signatures from my brother priests, I stopped in St. Michael the Archangel church in Sigel because I hadn't been inside in quite some time. The window is directly above the door to what is now the restroom; I suspect the room was originally a sacristy. The humorous part is that the door leads right into the restoom - no hallway or antechamber - with the window clearly visible from within the restroom. Just one more reminder that God is always watching. Today I wish to discuss with you two things: first, prayer; and second, the Church. We approach the Lord with many needs and desires in prayer, but the sum of these requests really amount to one thing: a happy life. Is that not what we mean when we pray for a swift recovery or a successful business meeting? Do we not really want to be happy when, as children (hopefully) we pray for a pony or as adults we pray for a bigger house or a better job? We think – in our foolish minds – that each of these things, together with many others, will somehow bring us happiness. We conveniently forget that we have prayed for other physical things to attain happiness before and although each of them promised happiness, none of them granted it. Our happiness is to be found in God alone and for this reason the Psalmist prays, and so we should we: “One thing I ask of the LORD, this I seek: To dwell in the LORD’S house all the days of my life, To gaze on the LORD’S beauty” (Psalm 27:4). A day spent in the Lord’s house is not at all like a day spent on earth. Here one day ends and another begins, bringing with it its own worries (cf. Matthew 6:34), but in heaven there is not a series of days, but only one day because Christ Jesus is “the Morning Star which never sets.” In heaven life does not progress toward its ending, towards death, for the life of heaven has no ending. How then do we attain this life? How do we find our way into the House of the Lord? We do so through prayer. So that we might faithfully follow the Way to heaven, he who is our Life taught us pray. God himself taught us to speak with him. He taught us to pray with few words because our “Father knows what you need before you ask him” (Matthew 6:8). Even so, through his parables Jesus teaches us to pray not so that God will be told our needs, but so that we might be more receptive to what he gives us in our need. Through the parable of the father and his son, Jesus tells us what will lead us to the happy life that we seek: namely, faith, hope and love. How does he do this, you ask? He does so through the example of the son who asks for bread, fish and an egg. When he asks for a fish the son asks his father for the gift of faith. Why? The fish symbolizes faith both because it lives in the element of water that is used for baptism, and because the fish traverses the waves of the ocean without harm. In the waters of baptism the gift of faith is given us so that we, too, can traverse the powerful waves of life and weather its storms without harm. Jesus asks, “What father among you would hand his son a snake when he asks for a fish?” because with its venomous tongue the serpent tempts us to disbelieve God (Luke 11:11). When the son asks his father for an egg he is asking for the gift of hope. Why? The bird inside the egg is not yet born but will be, and therefore symbolizes the gift of hope. He who hopes always looks to what is to come. We who hope in the Lord look to his Second Coming in glory. Jesus contrasts the gift of the egg with a scorpion because whoever is near a scorpion is always looking behind, to the scorpion’s tail. The venomous sting of the scorpion causes not hope, but fear. Lastly, when the son asks for a loaf of bread he asks for the gift of love, of charity, the highest form. Why does bread signify love? Just as love is the greatest of the theological virtues, so is bread the greatest of foods because of its usefulness. Jesus contrasts the gift of bread with a stone because the stone symbolizes hardness of heart caused by pride, which knows only selfishness. Jesus teaches us to pray for the theological virtues of faith, hope and love that come from God alone given us through the sacraments offered us in his Church. Now we have arrived at the second theme. Talk briefly about the article as already done here and here. Last night the pastor and I went out to dinner with a parishioner. I had a craving last night for fried fish of any sort and so off we went to find some. We went to the Rain Tree Cafe, here in Effingham, and had some of the best fish I've had in many years. I had breaded walleye with the perfect amont of seasonings, and it was all you can eat (I had three pieces). It was excellent! It comes with my hearty recommendation. In fifty-one weeks' time I am to be the spiritual directer for Great River Teens Encounter Christ #253. The lay directors for the weekend have been good friends of mine since my first TEC weekend, #162, ten years ago. I'm very much looking forward to the weekend. They are an excellent example of committed love, whose hearts are large and generous. If you would, please join me in offering this prayer each day for the success of the weekend. You are stealth, complex, and creative.You never face problems head on. Instead, you rely on your craftiness to get your way.A mystery to others, you thrive on being a little misunderstood.You happily work behind the scenes... because there's nothing better than a sneak attack! Hat tip to From Across the Net. 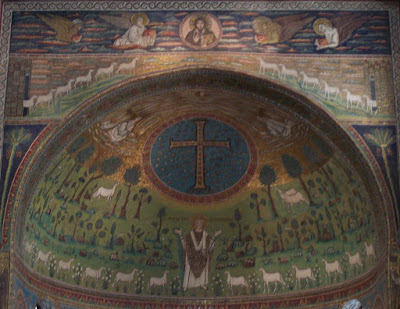 Thom at Ad Dominum has interesting looking post on Christian and Islamic mysticism. Sr. Mary Martha has another good post on modesty and decorum (with a great sample letter from a pastor). Be ready for a good of sarcasm! Fr. Daren of Servant and Steward's blog is in one word...GREAT. In that I mean, here is a priest, a young priest at that, who has a great sense of humor yet is so profound in his homilies and reflections. Yes, there are other wonderful blogger priests like Fr. Daren but somehow, his personal stories have really left an impression with me. He is also the first blogger (other than my Hawaii friends) that I have met in person. Thanks, Esther! I'm very grateful! Be sure to take a look at her other awardees. If you haven't yet read it, or if you haven't read it in a while, be sure to read the Holy Father's catechesis on St. James the Greater, whose feast we celebrate today. It's well worth it. As you might have guessed, blogging will be light this week as there are a number of items in the fire at the moment. The contest with the paper continues, and likely will for some time. I have a funeral tomorrow, an office to organize, classes to prepare and host of other things. I'll to post a little something each day for your enjoyment, but no promises. My meeting with the publisher of the Effingham Daily News went about as well as could be expected but still not as I had hoped. He agreed to contact the Associated Press for clarification of the article. He would not accept the fact that the article was false and he also would not accept the actual documents I brought with me to read and judge for himself. He will not issue an apology for the false article claiming something about contract with the Associated Press (which, even if true, is still quite inexcusable). And so the battle wages on. I spent much of the day today - all afternoon and well into the evening - driving around the deanery collecting the signatures from the local priests. I spent an hour and a half visiting with one of the priests, two hours with another, and another hour and a half with a third. It was a great joy! We don't have too many opportunities - or at least we don't seek them out - to visit with each other one on one. I must say that the Effingham Deanery is blessed with very good priests, not to mention ones who have been very supportive of my efforts with the paper. We, the undersigned Roman Catholic Priests ministering in the Effingham Deanery of the Diocese of Springfield in Illinois, do hereby protest the false representation of the Roman Catholic Church and her teachings by the Effingham Daily News. On Tuesday, 10 July 2007, the Effingham Daily News published an Associated Press article by Ms. Nicole Winfield titled, “Other Christians,” containing several misrepresentations of the document issued the same day by the Congregation for the Doctrine of the Faith entitled, “Responses to Some Questions Regarding Certain Aspects of the Doctrine on the Church.” Ms. Winfield’s article falsely quoted from the document of the same Congregation issued in 2000, “Dominus Iesus,” together with other false statements. The Effingham Daily News edited Ms. Winfield’s article, originally titled “Pope: Other Christians not true churches,” thereby making the article more accusatory and condemnatory of the Roman Catholic Church and further blurring fact and fiction. We, the undersigned, sincerely and urgently call for a formal notice within the pages of the Effingham Daily News recognizing and correcting the false statements made within the article. Furthermore, we request - in the strongest terms possible - a printed apology for the harm caused by such a lack of professionalism. We respectfully ask that both of these be done without delay and placed where clearly visible. What follows is my revised letter to the editor responding to the letter posted here earlier. I am grateful for your comments and suggestions. Mr. Michael Antrim posits several erroneous claims in his letter, “Salvation found in Scriptures,” published in the 20 July 2007 issue of the Effingham Daily News. Many of his questions are, no doubt, rhetorical. Nevertheless, they do have answers and these I will endeavor to provide. If these prove unsatisfactory, he would do well to consult Catholic Answers at www.catholic.com/library/ or to consult the Catechism [the Teaching] of the Catholic Church. There he will find at least, on average, eight Scriptural references per page (and in the Catholic Mass 90% of the Scriptures are proclaimed, recited and sung). Before rushing to rash conclusions about what somebody or some group says in particular or in general, the wise person always reads first what the other says and then responds, rather than relying on hearsay or somebody else’s account. Notice that Saint Paul does not tell Saint Timothy to hand on what he has read, but rather what he has heard. If these sayings were unimportant there would be no need to hand them on. Here, then, is a Scriptural basis for the Apostolic succession. The Apostle does not tell Timothy to tell everybody but only some so that Paul’s own teaching may continue after him. These passages might also be consulted: I Corinthians 11:2; II Thessalonians 2:15 and 3:6. The Apostolic succession is necessary for salvation in that Christ has given it to the Church and he does not give useless or needless gifts. From early historical evidence – which is documented outside of the Scriptures because the Scriptures concern the life of Christ Jesus and the Apostles – we learn for certain that as Christ entrusted his ministry to the Apostles, they entrusted their ministry to specific men who succeeded them. The Apostles handed on through the laying on of hands (I Timothy 1:6) the authority Christ gave them to continue his mission until he comes in glory. These chosen men in turn handed on the authority given to them by the Apostles through the laying on of hands to other chosen men. This is the Apostolic succession as intended by Christ. Mr. Antrim asks, “Where is the ordination of priests or the primacy of the Pope?” If Mr. Antrim is looking for the rite of ordination of priests in the Scriptures, he will not find it. Then again, he will also not find the rite of baptism described, yet we know baptisms were held. What he will find, however, are numerous references to the New Covenant priests (often called presbyters to maintain a distinction from the Jewish priesthood; the New Covenant priesthood has three ranks: bishop, priest and deacon). Some of the references are found in these passages: Acts 6:1-6; II Corinthians 3:6, 6:4 and 11:23; Ephesians 3:7; I Timothy 5:17 and 19-22; II Timothy 4:5; Titus 1:5; James 5:14-15 and I Peter 5:1. There are many others besides and a good knowledge of Greek – the original language in which the texts were written - together with a good knowledge of Old Testament terminology will be most useful if not essential. As for the second part of this question, Saint Peter, as the first Bishop of Rome and the one upon whom Christ established his Church, is the first Pope and there is a large body of evidence demonstrating Peter’s primacy among the Twelve. Peter is always listed first when the names of the Apostles are listed (Matt. 10:1-4; Mark 3:16-19; Luke 6:14-16; Acts 1:13); the Apostles are sometimes called "Peter and those who were with him" (Luke 9:32). It was Peter who spoke on behalf of the Apostles (Matt. 18:21; Mark 8:29; Luke 12:41; John 6:68-69), and he who is present in the most dramatic passages (Matt. 14:28-32; Matt. 17:24-27; Mark 10:23-28). It was Peter who first preached to the crowds in Jerusalem on Pentecost (Acts 2:14-40), and through him that the first healing in the Church was worked (Acts 3:6-7). Peter’s faith will strengthen the brethren (Luke 22:32) and Christ Jesus gives his flock to Peter (John 21:17). An angel announced the resurrection to Peter (Mark 16:7), and Christ, risen from the dead, appears to Peter first (Luke 24:34). Peter presided at the election of Matthias to replace Judas (Acts 1:13-26), and he received the first converts (Acts 2:41). Peter inflicted the first punishment (Acts 5:1-11), and excommunicated the first heretic (Acts 8:18-23). He presided over the first council in Jerusalem (Acts 15), and proclaimed the first dogmatic decision of the Church (Acts 15:7-11). It was to Peter that the revelation came that Gentiles were to be baptized and accepted as Christians (Acts 10:46-48). From these passages it is clear that Peter holds the primacy within the Apostles, and because the Pope, the Bishop of Rome, is the successor to the ministry of Peter, he retains the primacy of Saint Peter among the successors of the Apostles, the Bishops. Mr. Antrim asks, “So how can you know if you are a member of that ‘one true church’? Hold it up to the Scriptures. You cannot be born into the church. You can only be born again.” Mr. Antrim is quite mistaken to say that you cannot be born into the church; you can only become a member of the Church if you are “born of water and spirit” (John 3:5) and this baptism is necessary for salvation (Mark 16:15; John 3:5; I Peter 3:21; and Romans 6:3-4). This is why Jesus commanded the Apostles: “Go therefore and make disciples of all nations, baptizing them in the name of the Father and of the Son and of the Holy Spirit, teaching them to observe all that I have commanded you” (Matthew 28:19-20). Here, again, is another reference to the Apostolic succession. Jesus does not say to teach what the Apostles have read, but what he has taught them. On a side note, Mr. Antrim claims that the Scriptures (by which he largely means the writings of the New Testament) “had already been declared at the time of Paul.” He then references I Corinthians 15:11: “Whether then it was I or they [the Apostles], so we preach and so you believed.” As you can see, this passage does not match his argument (this is the case with many of his references). Paul says they believed what was preached, what was said, and not what was written. Because of their personal contact and involvement in the ministry and Paschal Mystery of Christ Jesus, the Apostles preached the Gospel; they did not read it. In point of fact, the writings of Paul and the Gospels were not recognized as part of the Scriptures at the time they were written. None of the New Testament writers – with the exception of Saint John with the Revelation – set out to write Scripture or claimed divine inspiration for their writings. It was the Church who discerned the inspired texts and collected them together and established them as Scripture and handed them on as such to succeeding generations. It is clear that not all of the Churches read all of Paul’s letters or all of the four Gospels in their liturgies in the first decades of the Church. Paul wrote to particular Churches who copied his letters – because they liked them, learned from them and were inspired by them – and sent them to other Churches, but not to all. The same is true of the four Gospels. There were other letters (we even know of at least one other letter Paul wrote to the Corinthians, though we do not have it [see I Corinthians 5:9]) and other gospels read during the liturgies of the early Churches, but for various reasons not all of these were included in the canon (the measuring rod) of Scripture when it was finalized by the Church in the fourth century when the matter was disputed (the Catholic Church does not define a teaching until it is contested, and even so only defines doctrine to correct heresy). To what were the accepted books and letters compared? To the tradition of the Apostles as maintained in the Church and handed on through the Apostolic succession, all under the guidance of the Holy Spirit. Mr. Antrim demonstrates a false understanding of history when he claims, “Paul warned sternly, before any Pope or Catholic church ever existed, not to accept any other doctrine.” Saint Peter is the first Pope and the Catholic (the universal) Church is founded upon him by Christ, as we have seen. As for the Pope “declaring” Apostolic succession, we have already seen how Saint Paul commands Timothy to keep the succession and how doctrines are not defined until confronted by heresy (if there is no heresy there is no reason to define a teaching). Even if no “Apostolic documents existed” at this time, it does not at all imply that the notion of the Apostolic succession was not present in the mind of Christ and in the minds of the Apostles and disciples; it implies, rather, that Apostolic succession was accepted by all and was not contested. Christ Jesus was raised from the dead, after all, some twenty years before Paul wrote his first letter and some thirty years before the Gospels were written, and Christians accepted the Resurrection straight away based on the oral testimony of the Apostles and witnesses of the Risen Lord; they had no writings at the time testifying to the Resurrection because they had not yet been written. Mr. Antrim asks, “So how can we know what the true church is and how to have true salvation?” One might well follow the words of Christ Jesus who said to Peter, “Blessed are you Simon Bar-Jonah! For flesh and blood did not reveal this to you, but my Father who is in heaven. And I tell you, you are Peter [petros/rock], and on this rock I will build my church, and the powers of death shall not prevail against it. I will give you the keys of the kingdom of heaven, and whatever you bind on earth shall be bound in heaven, and whatever you loose on earth shall be loosed in heaven” (Matthew 16:17-19). Mr. Antrim asks, “What do we need the Pope or the Pope’s doctrine for?” For starters, Christ Jesus gave the Pope to the Church through Saint Peter (see John 21:15-17). What better need have we for the Pope? At the same time, the Pope’s doctrine is not his own but is the teaching of the Church, who speaks on behalf of Christ. We need the Pope to strengthen the brethren (Luke 32:22) and maintain the integrity of the faith, to be the visible sign of our unity in the Body of Christ. Indeed, all people will find salvation in the “Pope’s doctrine” for his doctrine is the doctrine of Christ and not his own as Mr. Antrim would see if he would read what the Pope himself has written or listen to what he says. In the future, Mr. Antrim – and others – might do well to follow the suggestion I gave in my letter to the editor, wrongly titled by the Effingham Daily News “Memorial of Our Lady of Mount Carmel,” published 19 July 2007, and read the actual documents of the Church for her teaching. Trusting the secular media for an accurate and correct presentation of the teachings of the Catholic Church is quite foolish and will only lead to lies, falsehood and misrepresentation as has been demonstrated numerous times in the past few months alone. The Scriptural references put forth by Mr. Antrim no more “oppose the Pope’s doctrine and would expose the Pope’s doctrine as an untruth,” as he suggests, any more than prove Mr. Antrim’s own claims; indeed, in many cases the passages he cites contradict Mr. Antrim’s positions. It is true that the Scriptures do refute what Mr. Antrim thinks the Pope teaches; but then again, contrary to the media’s portrayal, that it is not at all what the Pope teaches. Friendship is a great gift and is filled with wonder. Each of us has within us the great desire for friendship, for companionship, and our Lord, too, sought friendship. Indeed, he seeks it from us still: “No longer do I call you servants,” he says, “for the servant does not know what his master is doing; but I have called you friends” (John 15:15). What must it have been like for Mary and Martha and Lazarus to be friends with Jesus? Have you ever wondered? How did they come to befriend Jesus? They lived in Bethany; Jesus lived briefly in Bethlehem and then in Nazareth. Together with Mary and Joseph he certainly would have visited Jerusalem each year, but how did he connect with these three? Were they relatives? Did their parents know Joachim and Ann, or even Joseph’s parents? I wonder about this, and I marvel at the gift of friendship with Jesus. It is very likely that Jesus chose to be friends with Mary, Martha and Lazarus, and not the other way around. Why? Because he says: “You did not choose me, but I chose you” (John 15:16). Simply consider it for a moment: to be chosen by Jesus to be his friend, to be his companion, to be his disciple. As Jesus chose Mary, Martha and Lazarus to be his friends so he chooses each of us. This truly is a humbling gift if we consider it even for a moment. Why would Jesus choose to be friends with us? He chooses us because he loves us. He loves us, not because we are especially good, particularly virtuous, or of any great merit, not because we are useful or even necessary to him; he loves us not, because we are good, but because he is good. He loves us, although we have nothing to offer him; he loves us, even in the ragged raiment of the prodigal son, who is no longer wearing anything lovable. This is the great wonder of friendship with the One who “is love” (I John 4:16). His friendship is not like our own. Why did the Lord befriend Mary and Martha and Lazarus? He befriended them because they knew that he loved them – they had heard his words and seen the works he performed - and they “welcomed him” (Luke 10:38). Like those two disciples on the road to Emmaus, “Jesus himself drew near” to the three and they said to him, “Stay with us, for it is toward evening and the day is now far spent” (Luke 24:15, 28). Like Abraham who welcomed the three strangers and put himself at their service, they said to Jesus, “Sir, if I may ask you this favor, please do not go on past your servant. Let some water be brought, that you may bathe your feet, and then rest” (Genesis 18:3-4). As the Lord draws near to us, what is our response? He draws near to us in the Scriptures when they read and whenever they are proclaimed in the Church. He draws near to us in the person of his bishops, priests and deacons. He draws near to us when the faithful gather together in his name. He draws near to us in the sacraments, especially in the Holy Eucharist. He draws near to us as friend. When he quietly draws near and speaks to us, when he stands before us, beside us and even within us, how do we respond? Do we recognize his presence and place ourselves at his service? Do we listen intently and eagerly to his words? Or do we simply keep walking by in the vain attempt to ignore his call to friendship? Do we truly know who it is who asks our friendship and seeks it out even to the point of giving his life on the Cross? Martha and Mary offer their love each in their own way. Martha follows the way of Sarah, seeing to the duties of hospitality and being “burdened with much serving” (Luke 10:40). Mary followed the way of Paul “to whom God chose to make known the riches of his glory” (Colossians 1:27). The Lord says that “Mary has chosen the better part” – not that Martha has chosen poorly – “and it will not be taken from her” (Luke 10:42). What does this mean? Christ Jesus humbled himself and took on our flesh; he humbled himself and became hungry and thirsty as we are (cf. Philippians 2:5-7). The Lord humbled himself to be fed by us whom he came to feed with his own Body and Blood. With deep concern, [Martha] prepared what the Holy of Holies and his saints would eat and drink in her house. It was an important but transitory work. It will not always be necessary to eat and drink, will it? When we cling to the most pure and perfect Goodness, serving will not be a necessity. If we are to fault Martha at all, we ought to fault her not because she demonstrated her love through service, but because she failed to follow Paul’s words: “Now I rejoice in my sufferings for your sake” (Colossians 1:24). As Martha was busy feeding Jesus Mary was busy eating was Jesus offered. Saint Peter said to Jesus, “Lord, to whom shall we go? You have the words of eternal life” (John 6:68). Like Jeremiah who devoured the scroll and found the words he ate to be “a joy and the delight of my heart” (Jeremiah 15:16), Mary knew that “man shall not live by bread alone, but by every word that proceeds from the mouth of God” (Matthew 4:4). She placed herself at his feet, ready to listen, to learn, to follow and to eat the words he spoke. Jesus himself is the food, the bread, we need for our pilgrim journey. This is why he gives himself to us in word and sacrament to strengthen us on our way. This is why we sing praise to him, because without his nourishment we could never make the journey. At present alleluia is for us a traveler’s song, but this tiresome journey brings us closer to home and rest where, all our busy activities over and done with, the only thing that will remain will be alleluia. That is the delightful part that Mary chose for herself, as she sat doing nothing but learning and praising, while her sister, Martha, was busy with all sorts of things. Indeed, what [Martha] was doing was necessary, but wasn’t going to last. Let us then, with Mary, chose “the better part” that will not be taken away from us (Luke 10:42). To cling always to God and to the things of God - this must be our major effort, this must be the road that the heart follows unswervingly. Any diversion, however impressive, must be regarded as secondary, low-grade and certainly dangerous. Let us listen intently to the Lord each day, to be friends with him, so that we might live in the presence of the Lord forever. Amen. Joseph Ratzinger (Pope Benedict XVI), What It Means to Be a Christian: Three Sermons. Henry Taylor, trans. (San Francisco, California: Ignatius Press, 2006), 69. Saint Augustine of Hippo, Sermon 252.2 in Ancient Christian Commentary on Scripture, New Testament III: Luke. Arthur A. Just, Jr., ed., et al. (Downers Grove, Illinois: InterVaristy Press, 2003), 182. Ephrem the Syrian, Commentary on Tatian’s Diatessaron 8.15 in Ibid., 183. Saint Augustine of Hippo, Sermon 255.1-2, in Ibid., 183. Saint John Cassian, Conference 1.8 in Ibid. ...though not this soon. One should never underestimate the damage a bit of arrogance, false information and a newspaper can render. It's nice to know the editor of the local paper is not concerned about printing falsehoods in her paper and won't print an apology or a correction because the article wasn't written by one of her reporters. Nevertheless, she is responsible for the contents of the paper. On July 10, the Effingham Daily News published an article titled "Other Christians" stating Pope Benedict XVI has declared all Orthodox churches as defective and other Christian denominations are not true churches adn they do not have the "means of salvation." Although that particular statement is in general a true statement [sic], it is made in the premise the Catholic Church is the one and only true church. First of all, I must state that the "one true church" existed and continues to exist without the need for the Pope's or any other man's approval and that neither have the authority to approve or disprove any institution that God has created. The Pope's approval or dispoval [sic] has no effect on anyone seeking salvation through Jesus Christ. It only has effect on the Pope's soul andthe souls of the Pope's disciples. So what does constitute the "true church" and what constitutes the "means of salvation." God choose [sic] the Scriptures (the Bible, the Gospels) as the medium where the true church is described for us today. This is the only place a person can go to find out how to become a member of the true church that Christ established. It is also the only place where a person can find out how to achieve salvation and how to live and maintain a Christian life. Paul wrote in Romans 16:17-18 to mark and avoid those who cause divisions and offenses contrary to the doctrine they had been taught. It would have been impossible to do that if that doctrine did not already exist. We, as Christians, can mark and avoid those same people using the same doctrine that they had by holding them up to the Scriptures. So why should we accept a man-made document rather than the words of God as our guide to salvation. By accepting the documents "approved by Benedict" you are placing your eternal salvation in the hands of a man rather than God. And yet, when the so called "Universal Church" is held up to the Scriptures, it becomes almost totally unrecognizable. This being true, then the "Universal Church" is the one that has caused divisions and offense contrary to Scripture. So how could they be the "one true church"? The article also says, "The other communities cannot be called churches in the proper sense because they do not have apostolic succession - the ability to trace their bishops back to Christ's original apostles." Will someone please tell me what book, chapter and verse of Scripture requires that the church, that Christ established, have "apostolic succession" as a means of salvation? I cannot find it. Where is the orindation of prests or the primacy of the Pope? If it is not in the Scriptures, it is a distortion or Scripture, it is a lie. The article did have at least one statement of truth, "Christ established here on earth only one church." So how do you know if you are a member of that "one true church"? Hold it up to the Scriptures. You cannot be born into the church. You can only be born again (John 3:5-7). If all Scripture (the will of God) is inspired by God (II Timothy 3:16); and we have the knowledge of all things pertaining to life and godliness (II Peter 1:22); and the Scriptures are the power of God for salvation (Romans 1:16), and the same Scriptures that save us had already been declared at the time of Paul (I Corinthians 15:11); what do we need the Pope or the Pope's doctrine for? Paul warned sternly, before any Pope or Catholic church ever existed, not to accept any other doctrine (Galatians 1:6-8). How could we do that if we needed to wait until after the Pope declared "Apostolic succession" as means of salvation? If we are not to accept any other doctrine, as Paul states in this verse, then we must have already been able to receive salvation and to become a member of the church that Christ created. Acts chapter 2 clearly indicates the one and only true church already existed and that as many as 3,000 souls, being baptized, had salvation. This was before any "Apostolic succession" documents existed. If we are to follow the pattern that Paul stated in Philippians 3:16-17, then that pattern must have already existed. Philippians 2:12 indicates that they had the ability to "work out their salvation." So how can we know what the true church is and how to have true salvation? The same way the Bereans did in Acts 17:11; they studied the Scriptures. Jesus states in Mark 16:16 "He who has believed and has been baptized shall be saved; but he who has disbelieved shall be condemned." We have all the documentation we need in the Scriptures in order to believe - John 20:31. We have all the documentation we need in the Scriptures to know how we are added to the one true church, Acts 2:38, Acts 2:41, and Acts 2:47. The Church is the body of Christ (Ephesians 1:22), and we are baptized into that body (Romans 6:3-5). Therefore, if we believe in Christ and have been baptized into Christ, into His body, into the Church, and we walk in newness of life; we will be raised again just as He was. That is God's promise. Once again I ask "What do we need the Pope or the Pope's doctrine for"? Any person on this earth can pick up the Bible, the Scriptures, and study how to be saved, how to become a member of the "one true Church." No one will find salvation in the Pope's doctrine. It is way past time we held our churches up to the Scriptures. If the Apostles and the 3,000 souls on the first day of the church can have salvation without "Apostolic succession," so can we. Of coarse [sic], as usual, the newspaper article and the television news (and I assume the documents the Pope released) did not have any Scriptural references to back up their claims. The obvious reason is that Scriptural references oppose the Pope's doctrine and would expose the Pope's doctrine as an untruth. My response, as of this moment, is as follows. Your comments and suggestions are most welcome. Mr. Michael Antrim [yes, I know; I realized it after I posted this and hoped nobody would notice; maybe you haven't ;)] posits several erroneous claims in his letter, “Salvation found in Scriptures,” published in the 20 July 2007 issue of the Effingham Daily News titled.” Many of his questions are, no doubt, rhetorical. Nevertheless, they do have answers and these I will endeavor to provide. If these prove unsatisfactory, he would do well to consult Catholic Answers at www.catholic.com/library/ or to consult the Catechism of the Catholic Church. There he will find at least, on average, eight Scriptural references per page (and in the Catholic Mass 90% of the Scriptures are proclaimed, recited and sung). Before rushing to rash conclusions about what somebody or some group says in a particular or in general, the wise person always reads first what the other says and then responds, rather than relying on hearsay or somebody else’s account. Mr. Antrim claims that “By accepting the documents ‘approved by Benedict’ you are placing your eternal salvation in the hands of a man rather than God.” The same could be said of those who following Mr. Antrim’s teachings in this letter, his own document. The same could be said of those who follow the teachings of Saint Paul – as all Christians do, or should; his claim is unfounded. If what Mr. Antrim says is true, that “If it is not found in the Scriptures, it is a distortion of Scripture, it is a lie,” then the mode through which he reads the Scriptures– that of sola Scriptura - is also a lie. This phrase, “Scripture alone”, so beloved of Martin Luther and the “reformers” is not found in the Scriptures. Mr. Antrim would do well to recognize that Christ established a teach Church (Matthew 28:19-20), not the principle of Scripture alone. Even within the New Testament there seems to be a clear preference for teaching orally rather than through the written text (II John 12 and III John 13). It is the Protestant denominations who have “caused divisions and offenses contrary to Scripture” when they broke away from the Catholic Church in the sixteenth century. The Catholic Church – together with the Orthodox and Eastern Catholic Churches - is the only Church that can trace itself –authentically and accurately – to the Apostles. No Protestant denomination existed prior to the sixteenth century. An truthful search of history alone will clearly and easily demonstrate this. From early historical evidence – which is documented outside of the Scriptures because the Scriptures concern the life of Christ Jesus and the Apostles – we learn for certain that as Christ entrusted his ministry to the Apostles, the Apostles entrusted their ministry to specific men who succeeded them. The Apostles handed on the authority Christ gave them to continue the mission of Christ until he comes in glory. These chosen men in turn handed on the authority given to them by the Apostles. This is the Apostolic succession. Mr. Antrim asks, “Where is the ordination of priests or the primacy of the Pope?” If Mr. Antrim is looking for the rite of ordination of priests in the Scriptures, he will not find it. Then again, he will also not find the rite of baptism described. What he will find, however, are numerous references to the New Covenant priests (often called presbyters to maintain a distinction with the Jewish priesthood; the New Covenant priesthood has three ranks, bishop, priest and deacon). Some of the references are found in these passages: Acts 6:1-6; II Corinthians 3:6, 6:4 and 11:23; Ephesians 3:7; I Timothy 5:17 and 19-22; II Timothy 4:5; Titus 1:5; James 5:14-15 and I Peter 5:1. There are many others besides and a good knowledge of Greek together with a good knowledge of Old Testament terminology will most useful if not essential. As for the second part of this question, Saint Peter, as the first Bishop of Rome and the one upon whom Christ established his Church, is the first Pope and there is a large body of evidence demonstrating Peter’s primacy among the Twelve. Peter is always listed first in the lists of the Apostles (Matt. 10:1-4, Mark 3:16-19, Luke 6:14-16, Acts 1:13); the Apostles are sometimes called "Peter and those who were with him" (Luke 9:32). It was Peter who spoke on behalf of the Apostles (Matt. 18:21, Mark 8:29, Luke 12:41, John 6:68-69), and he who is present in the most dramatic passages (Matt. 14:28-32, Matt. 17:24-27, Mark 10:23-28). It was Peter who first preached to the crowds in Jerusalem on Pentecost (Acts 2:14-40), and the first healing in the Church was worked through Peter (Acts 3:6-7). Peter’s faith will strengthen the brethren (Luke 22:32) and Christ Jesus gives his flock to Peter (John 21:17). An angel announced the resurrection to Peter (Mark 16:7), and Christ, risen from the dead, appears to Peter first (Luke 24:34). Peter presided at the election of Matthias to replace Judas (Acts 1:13-26), and he received the first converts (Acts 2:41). 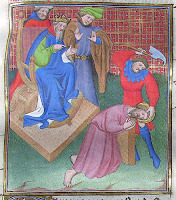 Peter inflicted the first punishment (Acts 5:1-11), and excommunicated the first heretic (Acts 8:18-23). He presided over the first council in Jerusalem (Acts 15), and proclaimed the first dogmatic decision of the Church (Acts 15:7-11). It was to Peter that the revelation came that Gentiles were to be baptized and accepted as Christians (Acts 10:46-48). From these passages it is clear that Peter holds the primacy within the Apostles, and because the Pope, the Bishop of Rome, is successor to the ministry of Peter, he retains the primacy of Saint Peter among the successors of the Apostles, the Bishops. Mr. Antrim asks, “So how can you know if you are a member of that ‘one true church’? Hold it up to the Scriptures. You cannot be born into the church. You can only be born again.” Mr. Antrim is mistaken to say that you cannot be born into the church. You can only become a member of the Church if you are “born of water and spirit” (John 3:5) and this baptism is necessary for salvation (Mark 16:15; John 3:5; I Peter 3:21; and Romans 6:3-4). This is why Jesus commanded the Apostles: “Go therefore and make disciples of all nations, baptizing them in the name of the Father and of the Son and of the Holy Spirit, teaching them to observe all that I have commanded you” (Matthew 28:19-20). Here, again, is another reference to the Apostolic succession. Jesus does not say to teach what the Apostles have read, but what he has taught them. On a side note, Mr. Antrim claims that the Scriptures (by which he largely means the writings of the New Testament) “had already been declared at the time of Paul.” He then references I Corinthians 15:11: “Whether then it was I or they [the Apostles], so we preach and so you believed.” As you can see, this passage does not match of his argument. (This is the case with many of his references. His seems to confuse what Paul calls the Gospel with the Scriptures in their totality; he forgets that for Paul the Scriptures meant only the Old Testament.) In point of fact, the writings of the Paul and the Gospels were not recognized as part of the Scriptures at the time of Saint Paul. Not all of the Churches read all of Paul’s letters or all of the four the Gospels in their Liturgies for the first decades of the Church. Paul wrote to particular Churches who copied his letters – because they liked them, learned from them and were inspired by them – and sent them to other Churches, but not to all. The same is true of the four Gospels. 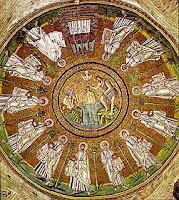 There were other letters and other gospels read during the liturgies of the early Churches, but for various reasons not all of these were included in the canon (the measuring rod) of Scripture when it was finalized by the Church in in the fourth century when the matter was disputed (the Catholic Church does not define a teaching until is contested, and even so only defines doctrine to correct heresy). To what were the accepted books and letters compared? To the tradition of the Apostles handed on through the Apostolic succession, all under the guidance of the Holy Spirit. Mr. Antrim demonstrates a false understanding of history when he claims “Paul warned sternly, before any Pope or Catholic ever existed, not to accept any other doctrine.” Saint Peter is the first Pope and the Catholic (the universal) Church is founded upon him by Christ, as we have seen. As for the Pope “declaring” Apostolic succession, we have already seen how Saint Paul commands to Timothy to keep the succession and how doctrines are not defined until confronted by heresy (if there is no heresy there is no reason to define a teaching). Even if no “Apostolic documents existed” at this time, it does not at all imply that the notion of the Apostolic succession was present in the mind of Christ and in the minds of the Apostles and disciples; it implies, rather, that Apostolic succession was accepted by all. Christ Jesus was raised from the dead, after all, some twenty years before Paul wrote his first letter and some thirty years before the Gospels were written, and Christians accepted the Resurrection straight away. Mr. Antrim asks, “Acts chapter 2 clearly indicates the one and only true church already existed and that as many as 3,000 souls, being baptized, had salvation. This was before any ‘Apostolic succession’ documents existed.” He is right that the only true church existed at the Pentecost event because Christ already established the Church on Peter. Mr. Antrim’s timeline is again mistaken. Mr. Antrim asks, “So how can we know what the true church is and how to have true salvation?” One might well follow the words of Christ Jesus who said to Peter, “Blessed are you Simon Bar-Jonah! For flesh and blood did not reveal this to you, but my Father who is in heaven. And I tell you, you are Peter [rock], and on this rock I will build my church, and the powers of death shall not prevail against it. I will give you the keys of the kingdom of heaven, and whatever you bind on earth shall be bound in heaven, and whatever you loose on earth shall be loosed in heaven” (Matthew 16:17-19). Mr. Antrim asks, “What do we need the Pope or the Pope’s doctrine for?” For starters, Christ Jesus gave the Pope to the Church through Saint Peter (see John 21:15-17). What better need have we for the Pope? At the same time, the Pope’s doctrine is not his own but is the teaching of the Church, who speaks on behalf of Christ. We need the Pope to strengthen the brethren (Luke 32:22) and maintain the integrity of the faith, to be the visible sign of our unity in the Body of Christ. Indeed, all people will find salvation in the “Pope’s doctrine” for his doctrine is the doctrine of Christ and not his own. In the future, Mr. Antrim – and others – might do well to follow the suggestion I gave in my letter to the editor, wrongly titled “Memorial of Our Lady of Mount Carmel,” published 19 July 2007, and read the actual documents of the Church for her teaching. Trusting the secular media for an accurate and correct presentation of the teachings of the Catholic Church is quite foolish and will only lead to lies, falsehood and misrepresentation. The Scriptural references Mr. Antrim puts forth no more “oppose the Pope’s doctrine and would expose the Pope’s doctrine as an untruth” any more than prove Mr. Antrim’s own claims; in many cases, the passages seem to contradict his positions. It is the true that the Scriptures do refute what Mr. Antrim thinks the Pope teaches; but then again, contrary to the media’s portrayal, that it is not what the Pope teaches. I will have to split this letter into two parts; your suggests here are certainly requested (if anybody read all of it ;c] ). My letter to the editor was published in tonight's issue of the Effingham Daily News. It was given the peculiar title, "Memorial of Our Lady of Mount Carmel." I wondered about this for several minutes until I realized what happened. At the top of all my letters I give the date and, if there is one, the name of the feast or memorial celebrated by the Church. I wrote the letter on the Memorial of Our Lady of Mount Carmel, who, of course, has nothing to do whatsover with the subject of the letter. In the future I suppose I'll have to title my letters myself and leave no work to an editor. They simply will not inquire even the slightest into matters Catholic (or apparently even read letters from Catholics). And they say Catholics are arrogant. It's very irritating. Annunciation Parish in Shumway, Illinois will host a Bible study led by the Rev. Daren J. Zehnle, Parochial Vicar of St. Anthony of Padua Parish in Effingham, Illinois. The Bible study will be held from 7:00 – 8:00 p.m. in the church basement on the following Tuesdays: July 24th, August 14th, August 28th, September 11th, October 2nd, October 9th and October 23rd. Additional dates will be added later in the Fall. The Bible study is free to all who attend and attendance is not required at all of the meetings; participants are free to come and go as they may. During the course of the Bible study the passages from the Scriptures proclaimed during the Sunday Masses will be explored, as well as other topics of interest to the group. The topic of angels will be discussed on October 2nd, the Memorial of the Guardian Angels on the Roman Catholic liturgical calendar. St. Anthony of Padua Parish will host a series of classes on the Twelve Apostles taught by the Rev. Daren J. Zehnle, Parochial Vicar of St. Anthony of Padua parish. The classes are free to all who attend and attendance is not required at all of the meetings; participants are free to come and go as they may. The forthcoming book, The Apostles: The Origin of the Church and Their Co-workers, by Pope Benedict XVI (Huntington, IN: Our Sunday Visitor, 2007, $14.95 [available July 26th]) from which the classes will be taken, is highly recommended, though not required. It's been a quiet day back in the parish. I spent most of the day unpacking and settling back in the rectory (I spent virtually no time in the office) and working on several projects that desparately need massive amounts of work (to which I hope to devote tomorrow). When school resumes - before any of us know it - I will be teaching in a different classroom than last year; this year I'll be in the same room for both of my classes :) But, as yet, we're not quite sure where that room will be. It might be that I get my very own room (for which I am very hopeful) and it might not. At any rate, I spent a good part of the morning sorting through my old room and removing things from the walls, collecting my chess sets, finding textbooks, and generally putting my things all in one spot. I have the rosters for my classes and I think I'm satisfied; I do expect a few transfers into my classes yet, though. Another large part of the day was spent sorting through insurance papers resulting from that nasty dislocated shoulder I suffered back in Paradise (from which, incidentally, I returned two months ago yesterday; I still miss it dearly). Let me tell you - as if you didn't already know - insurance papers are not any fun at all. I think a group of people sat down to create the most indecipherable papers imaginable and created special ways to send you lots of them all at the same time for different things. I know that I filled out and sent in - at least - five papers all asking how the injury happened, when and where it happened, if it was work related and if someone else was involved/responsible. I don't want to fill out another one. Why can't it all be put together in one document, clear and to the point: when all is said and done, you owe this; we paid this. That would be too easy, I suppose. I'm going to post a couple of other items and then offer the Mass. Blogging will be lighter than normal through Monday; just a heads up. What a man is in the eyes of God, that he is and nothing more. Remain, Lord, with those in our societies who are most vulnerable; remain with the poor and the lowly, with indigenous peoples and Afro-Americans, who have not always found space and support to express the richness of their culture and the wisdom of their identity. Remain, Lord, with our children and with our young people, who are the hope and the treasure of our Continent, protect them from so many snares that attack their innocence and their legitimate hopes. O Good Shepherd, remain with our elderly and with our sick. Strengthen them all in faith, so that they may be your disciples and missionaries! My nephew, Matthew William, celebrates his first birthday today. A party was held for him yesterday in one of Quincy's many beautiful parks. Regretably, I was unable to be there yesterday and again this evening. The summer continues to be filled with many surprises and turns of fortune. As I arrived in Effingham Friday evening for a wedding rehearsal it occurred to me that the pastor was away on vacation and would be for a week and that one of the retired priests who has been generously filling in for me was leaving on Monday (today). I knew at that moment we would have a funeral this week, my last week to be at the Liturgical Institute. Sure enough, at 7:20 Saturday morning the telephone rang and I knew it was one of two places: the hospital or the funeral home. It was the funeral home; funeral on Tuesday. So here I am yet this evening in Effingham. After the funeral tomorrow I will return to the Liturgical Institute to collect the remainer of my things and return to Effingham Wednesday night or Thursday afternoon. Perhaps that way I will at least be able to write/finish one paper on Friday (of the three I set out to write this summer). The summer, though most enjoyable and refreshing in a strange way, has been thoroughly unproductive. It seems the more I try to finish this degree for the good of the Church, the more God seems to disallow its completion. Oddly enough, I'm not too concerned about it. When God wills it shall be completed. At any rate, happy birthday, Matthew! The Lord bless you and keep you! The Lord turn his face toward and be gracious to you! The Lord make his countenance shine upon you and give you peace! Amen. Saint Joseph, pray for him. Saint David, pray for him. Saint Angela, pray for him. Saint Matthew, pray for him. Saint William, pray for him. All you saints of God, pray for him. The article is only partially correct and as a whole is quite misleading and false. The mainstream media has again proven itself utterly incapable of giving an accurate portrayal of the teachings of the Catholic Church. Such a false portrayal of the Catholic Church is tolerated – and even encouraged – throughout society, yet a similar false representation of Jewish, Islamic, Protestant or Buddhist teaching is not. Anti-Catholicism remains, as the historian Philip Jenkins – himself a Protestant - notes, “the last acceptable prejudice" in America. [T]hese Communities do not enjoy apostolic succession in the sacrament of Orders, and are, therefore, deprived of a constitutive element of the Church. 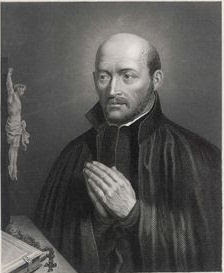 These ecclesial Communities which, specifically because of the absence of the sacramental priesthood, have not preserved the genuine and integral substance of the Eucharistic Mystery cannot, according to Catholic doctrine, be called “Churches” in the proper sense (Response to the Fifth Question). It is because the Protestant denominations have not maintained unity with Peter through his successor and because they do not have a valid priesthood or a valid Eucharist that they are called “ecclesial communities” and not “Churches.” Nowhere do any of the documents refer to them as “merely” ecclesial communities, as the Associated Press article indicates. Referring to Protestant denominations as ecclesial communities is not a pejorative description but rather a recognition of reality; they have not maintained the tradition of the Apostles. [T]hese separated Churches [Eastern Catholic Churches] and [ecclesial] communities as such, though we believe they suffer from defects, have by no means been deprived of significance and importance in the mystery of salvation. For the spirit of Christ has not refrained from using them as means of salvation which derive their efficacy from the very fullness of grace and truth entrusted to the Catholic Church” (Dominus Iesus, 17 [emphasis mine]). From this it is plain that the article was not at all correct in its primary claim. Rather than reporting the facts its reports falsehood and lies. While the Catholic Church teaches that she has received from Christ the fullness of the means of salvation, she also recognizes that Christ’s salvific grace is present and at work in all who seek God with a sincere heart and clear conscience, properly formed. 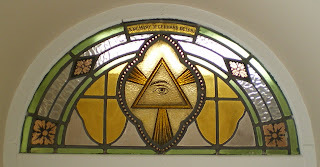 What is more, the document issued on Tuesday reaffirmed “that the Church of Christ is present and operative in the churches and ecclesial Communities not yet fully in communion with the Catholic Church, on account of the elements of sanctification and truth that are present in them” (Response to the Second Question). Furthermore, it clarified the teaching of the Catholic Church in order to foster ecumenical dialogue by stating clearly the beliefs and teachings of the Catholic Church. The document has been well received by both the Russian Orthodox and the Anglican Communion (from Canterbury), as well as by many other others, contrary to the claims of the media. Both Dominus Iesus and Responses to Some Questions Regarding Certain Aspects of the Doctrine on the Church, together with commentary, are available on the web site of the Holy See (www.vatican.va) under the Congregation for the Doctrine of the Faith. If you have questions about these documents I suggest you read them and not trust the media’s portrayal of them; the media has heretofore proven itself entirely unreliable. The Effingham Daily News should be ashamed for publishing such a misleading and erroneous article and should apologize for the harm it has caused in the community. To all those who have come looking for the documents I mentioned in the homily: welcome! "Responses to Some Questions Regarding Certain Aspects of the Doctrine on the Church"
Commentary on the Document "Responses to Some Questions Regarding Certain Aspects of the Doctrine on the Church"
What follows is something of the homily that I gave this weekend; it is a bit more in places and a bit less in others. I'll work on finishing up my letter to the editor and when I post that the homily will more or less be posted online. “Do this and you will live,” says the Lord Jesus Christ (Luke 10:28). If we follow the commandments we will have eternal life through the grace of Christ; the way to life eternal is through love. This seems so very simple, and yet we know how very difficult it can be. We get stuck in our pride and while we love ourselves and our own desires we neglect to love our neighbor as ourself, much less the Lord God. How, then, are you – and I - to “love the Lord, your God, with all your heart, with all your being, with all your strength, and with all your mind, and your neighbor as yourself” (Luke 10:27)? We do so when we follow the teachings of Holy Mother Church which Christ Jesus established as the means to salvation. This past Tuesday, the Congregation for the Doctrine of the Faith released a document entitled, “Responses to Some Questions Regarding Certain Aspects of the Doctrine on the Church.” This document answers five basic questions about the nature of the Church and clarifies the teaching of the Second Vatican Council which has been called into question, distorted and falsified. You might have seen the Associated Press article titled “Other Christians” in the Effingham Daily News Tuesday night [the full AP version is here, slightly better than what appeared in the EDN]. This brief article has caused a great deal of hurt in the area because of its false claims and poor journalistic standards. To be blunt, the article is filled with half-truths and lies. It is a piece of anti-Catholic slander, the last acceptable prejudice in America. The document issued on Tuesday by the Congregation for the Doctrine of the Faith seeks to correct false beliefs about the nature of the Church and to clarify authentic Catholic teaching. Christ … established and continually sustains here on earth His holy Church, the community of faith, hope and charity, as an entity with visible delineation (9*) through which He communicated truth and grace to all. The Church, then, is one reality, not several. Christ did not establish a series of Churches, but one universal Church. The spiritual elements of the Church cannot be distinguished from the visible form of the Church. For this reason we often speak of three parts, as it were: the Church triumphant (the Saints in heaven); the Church suffering (the poor souls being purged of their sins in Purgatory); and the Church militant (those of us here fighting the good fight who run the race so as to win the prize [see II Timothy 4:7]). These three are all part of the Mystical Body of Christ with Christ himself as our Head. In other words, the hierarchical and physical structure of the Church is not separate from Christ Jesus but intimately connected to him. Christ uses the Church as his instrument to dispense his grace to the world. The physical Church builds up the Mystical Body of Christ. 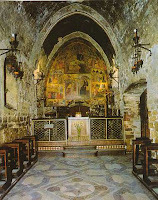 Christ Jesus founded the Church on the Apostle Peter with the rest of the Twelve. This foundation upon the Apostles is essential to the nature of the Church for it is through the apostolic succession that the mandate of missionary activity is handed on through the ages in every place. It is the through the apostolic succession that the faith of the Church is handed on through the apostolic tradition in the Church. This Church constituted and organized in the world as a society, subsists in the Catholic Church, which is governed by the successor of Peter and by the Bishops in communion with him,(13*) although many elements of sanctification and of truth are found outside of its visible structure. These elements, as gifts belonging to the Church of Christ, are forces impelling toward catholic unity. With this passage we come to the difficulty of the past many years. It is this passage which many who claimed to teach in the name of the Church wrongly interpreted. It is these false interpretations that the document issued on Tuesday seeks to remedy and clarify. What does this passage mean? It means that everything that is necessary for salvation is found within the Catholic Church; within the Church nothing is lacking. What are these means to salvation? The Scriptures; prayer; the Sacraments, especially the valid Eucharist; the apostolic succession; union with the Bishop of Rome, the Pope, who shepherds the Church in the name of Christ. The many Protestant denominations are not “Churches” in the proper sense because they do not have the apostolic succession or a valid Eucharist, neither are they in union with the Pope. Because of this we refer to them not as Churches but as “ecclesial communities,” as Church-like communities. The Protestant denominations have some of the means to salvation: the Scriptures, prayer, and Baptism; and the Holy Spirit is indeed active within them. Nevertheless, they have neither a valid Eucharist nor Apostolic Succession and they are not in union with the Successor of Peter. It follows that these separated churches and Communities, though we believe they suffer from defects, are deprived neither of significance nor importance in the mystery of salvation. In fact the Spirit of Christ has not refrained from using them as instruments of salvation, whose value derives from that fullness of grace and of truth which has been entrusted to the Catholic Church. Even so, whatever graces are received within the ecclesial communities flows from the pierced side of Christ through the Catholic Church. There is no better comment to make than to say that this promulgation really changes nothing of the traditional doctrine. What Christ willed, we also will. What was, still is. What the Church has taught down through the centuries, we also teach. In simple terms that which was assumed, is now explicit; that which was uncertain, is now clarified; that which was meditated upon, discussed and sometimes argued over, is not put together in one clear formulation. The same is true of the document issued this past Tuesday. The Catholic Church is the Church of Christ for to her Jesus Christ has entrusted the Sacraments and the Tradition of the Apostles, and it is within her that Christ nourishes us with his Body and Blood. Within the fold of the one Church of Christ we can indeed love the Lord our God with our whole heart, being, strength and mind, and our neighbor as ourselves. “Responses to Some Questions Regarding Certain Aspects of the Doctrine on the Church,” Response to Question Five. Pope Paul VI, Address of 21 November 1964. Fr. Toborowsky has a good photo caption today - and he's right! Thom at Ad Dominum has an excellent post on the Franciscan connections he sees Benedict XVI's motu proprio Summorum Pontificum. Fr. Zuhlsorf comments - and shreds - Sr. Joan Chittester's reaction to Summorum Pontificum. I'm glad he did so I don't have too. Today’s Gospel is one that has inspired the lives of countless saints of God. Having heard this memorable passage, they turned their lives around and proclaimed the Gospel far and wide. When I head out for a walk around the lake I most always put on my sandals and take my walking stick, in direct defiance of Jesus’ command. This passage has long bothered me, especially when I go out for a walk, in part because it seems so senseless. We place sandals and shoes upon our feet in order to lessen the pain of the journey and to speed our travels. With our feet shod we travel greater distances with less difficulty. With staff in hand we do the same and traverse ever farther with greater ease and we are protected from those who would seek to harm us. What is wrong with this? Why would the Lord forbid staff and sandals? Staff and sandals are, in one sense, a way of asserting our independence and our strength; they are a way of relying on our own power and ingenuity, not of recalling the marvels that the Lord has done. What, then, is the Lord teaching us? He is teaching us to trust fully in him, to rely not on our own ability and prowess but to rely on his grace alone. Only in this way can the Kingdom of heaven be proclaimed by his followers; only in this way can his peace reign in our hearts and we keep his commands. Hearing this Gospel, Saint Francis of Assisi exclaimed: “This is what I want. This is what I desire with all my heart.” Immediately thereafter Francis placed his life in the hands of the Lord. Let us do the same. Saint Bonaventure, Majory Legend, 3.1. The Crescat describes the medal of St. Benedict and also has a post for today's lectio with a couple images of the Saint. 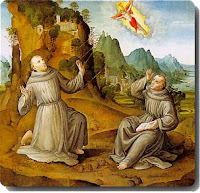 I would be quite remiss today if I did not say something about Saint Francis of Assisi's relationship to the Benedictines, a connection perhaps that is little considered (and I am not the one to give it due consideration). as the most beloved of the Virgin (Major Life, 2.8). 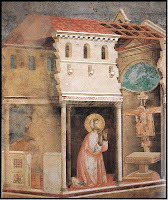 In their generosity, the sons of Saint Benedict allowed Saint Francis and his sons the use of the Portiuncula, the Little Portion. To this day it is an extraordinary place, and for more reasons than seeing a tiny little church within a large basilica. See to it, my sons, that you never abandon this place. If you are driven out from one side, go back in at the other. For this place is truly holy and is the dwelling of the Most High God. Here, when we were but a few, the Most High gave us increase; here he enlightened the hearts of his poor ones by the light of his wisdom; here he set our wills afire with the fire of his love. Here he who prays with a devout heart will obtain what he prays for and he who offendswill be punished more severely. Wherefore, my sons, consider this dwelling place of God to be worthy of all honor, and with all your heart, with the voice of joy and praise, give glory to God in this place (Celano, First Life, 106). We who seek to follow holy father Francis owe a debt of gratitude to Saint Benedict and his sons. What does it mean to "subsistit in"? DrPepper, Pope Benedict XVI, and a "high five"